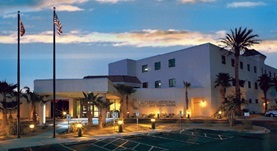 Dr. James Lawrence graduated the medical school from the Universidad Autonoma de Guadalajara and then completed two residency programs, one at the Saint Francis Hospital and the other at the Maricopa Medical Center. A fellowship at the Chicago Medical School followed soon after that. Dr. Lawrence is now specialized in pulmonology and also board certified in critical care medicine, pulmonary disease, and sleep medicine. He has been practicing medicine for more than 20 years and is affiliated with the Western Arizona Regional Medical Center.